If the statement in the headline of this post—Paul Pogba is good—seems ridiculous to you, too trivially obvious to be worth saying, then you’re in luck, because it means you haven’t had your mind numbed by some of the predictably over-the-top criticism he has been subject to since joining the Premier League, the biggest circus in world soccer. Pogba cost Manchester United whole lot of money last summer—just under £90 million in fact, the most ever paid for a single player. Since rejoining the Red Devils, he’s been a good player in the various roles he’s been asked to assume, sometimes playing just okay, other times looking flat-out great. These are facts that nearly everyone agrees on, and are exactly what anyone with any real familiarity with Pogba’s specific skills and his current place on his overarching career trajectory could’ve reasonably predicted. But somehow, people who broadly agree about all this reach wildly divergent conclusions on what this all means when assessing the player’s as a whole. Pogba has come under a wave of criticism recently, especially after yesterday’s loss to Chelsea in the F.A. Cup. This is odd for a couple reasons: United spent most of the game down a man which makes it hard for any player to look good, and anyway José Mourinho had the team playing an ultra-defensive setup which was never going to maximize Pogba’s talents. 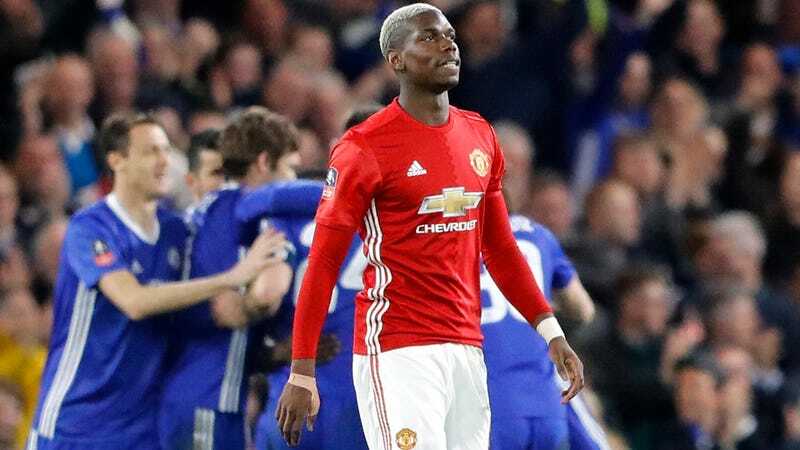 But United lost and Pogba didn’t play well, while another high-profile midfield summer transfer, Chelsea’s N’Golo Kanté, had a good game for a team that’s playing really well this season, so it was time to pile on Pogba for not being good enough this year. “He’s not a game changer,” claimed Lampard on Sky Sports. “It was a signal of their intentions to spend £90m on someone I would say isn’t a finished article. “When you have a £90m price tag you wonder more... and you’re left still thinking what player he is... he hasn’t quite delivered and he hasn’t been a game changer. “When Jose Mourinho is playing a two [central midfielders] he wants them to defend but he’s not busting a gut to get back... he realises far too late,” added Lampard. “My question is how much do you want him in these deep roles? For me Michael Carrick is in the team to play deep... if he’s not close enough he’s not going to get the numbers. You’ve got this player you want to get into your team but what’s the best place for him? “Paul is being criticised but he’s had an OK season at Old Trafford,” Ferdinand, who won six Premier League titles and the Champions League with United, said. “We’ve seen glimpses of what he can do. It’s now about him putting it together consistently, over 90 minutes and a whole campaign. I’m certain that will come. “Pogba is hammered for not defending and not scoring enough. United didn’t buy him to be a defender or to score 30 goals a season. They bought him on his form for Juventus, where he had a loose, almost free role in a three-man midfield. United invested in a creative player, somebody to come in, make chances and be the dictator of the team. Reading Lampard’s assessment and Ferdinand’s, you’ll notice that they’re basically identical. Both recognize that Pogba’s not been terrible, that he’s shown flashes of the ability that made him the world’s most expensive signing, that he’s not been helped by being asked to play defensive positions that don’t suit him, and that there’s good reason to think he and Mourinho will eventually figure out a way to solve things in a way that eventually see Pogba become as good as everyone believes he can be. And yet despite all of this agreement, Lampard thinks Pogba has been disappointing while Ferdinand thinks he’s been perfectly fine. The best explanation for this gap between what Lampard and Ferdinand think—and it’s the same gap you’ll find between most of the (non-stupid) pro- and anti-Pogba contingents—has to do with his transfer fee and the expectations that come along with it. Lampard makes this clear when mentioning how, if you’re spending all-time sums of money to sign a player, you’d expect him to be of the highest caliber right off the bat. It’s understandable, given that United signed Pogba for a fee greater than Real Madrid paid for Cristiano Ronaldo and didn’t immediately get Ronaldo levels of production, that people would notice this and criticize Pogba for not living up to the fee. However, none of that is at all relevant when discussing Pogba’s current abilities and how he’s performed in the roles he’s been instructed to fill. Transfer fees themselves are only partly related to how good a player currently is. It should’ve been obvious to everyone even before Pogba came to England that he was not a 20-goals-a-season player, nor was he a lockdown defensive specialist, and, above all that despite his evident technical and physical abilities and limitless potential, he was nowhere near a fully-realized talent. The whole reason why he cost so much in the first place wasn’t because he was the best player in the world, but because he had a great shot of becoming something close to that—the kind of player you might not be able to buy at any price—in the future. And not only was it clear that it would take at least a season or two before Pogba could lay claim to the status his prodigious gifts seemed to ordain for him, that of the world’s preeminent central midfielder, it was just as clear that Pogba would need a very specific tactical role in order to consistently hit the peaks he’d already reached during his time at Juventus. This too is something that both Lampard and Ferdinand hint at in their comments about Pogba. They both mention how putting Pogba in a position with significant defensive responsibilities and strict positional discipline does not best serve his skill set. This, as we said at the time of the move, is incredibly obvious—as is the fact that Pogba has time and again shown that he plays best best in one of the advanced midfield spots in a three-man midfield, afforded license to roam all over the pitch, surrounded by more disciplined players to maintain the right balance. Yet many blame Pogba for not being good enough at things he’s never been good at rather than criticizing Mourinho for continuing to play Pogba—a world-elite attacker when allowed to get forward from the center of the pitch—as one of the deep central midfielders in a 4-2-3-1 double pivot. Mourinho, to his credit, has come around and begun using a lot more 4-3-3 this season after accepting what many already knew about Pogba’s ideal position, and, lo and behold, Pogba has played very well in that system. Here is what we know right now: Paul Pogba is a really good player who has not consistently played to the best of his current abilities, yet still shows glimpses from time to time of his enormous potential. He remains a really good player in the present who projects to be one of the world’s very best in the near future. He is a natural No. 8, not a 6 or a 10, and needs space and freedom to attack to be most effective. He has all the technique and spatial awareness and passing range and knack for scoring and setting up goals needed to dominate games as one of those rarest of midfielders, a true hybrid capable of being both a controlling and a creative presence in the center of the pitch. He is not there yet, and needs to work on his decision making and his reading of the game (whether he should speed things up or slow them down) if he’s ever to be as good a player as he can be. The thing is, this is exactly what we knew about Pogba this summer before he made the move to United. Nothing Pogba has done in a red shirt this season should have changed anyone’s mind about his current and potential ability. Indeed, when you look at what people are actually saying about him, both Pogba’s skeptics and supporters don’t actually see things all that differently. The difference is that pessimists focus on how much money Pogba cost and the fact that United haven’t had an awesome season, and so they speak about Pogba’s well-known shortcomings as if the mere fact that so much money was spent should’ve transformed him into a player he never was. I’d also wager that even those criticizing Pogba now for not living up to some meaningless standard his fee conjured in their minds would still happily pay every cent of that to bring Pogba to United if given the choice to do it over. Paul Pogba is good. He’s played pretty well overall this year, especially when his manager has played him in the right system, and has a lot of room to develop into an even better player as the years go by. If you don’t think he’s been good enough, or that the transfer fee and salary he commands are themselves enough to expect the world from him, then you never understood who Pogba was and what he would be this year in the first place.